2. The Indian concept of “philosophy”. “Hinduism” is a general term encompassing numerous beliefs, customs, traditions and rituals. It was originally a term coined by foreign invaders to describe the religion practised in the sub-continent of India. The name originated from the river Indus. India was called ‘Ind’ or ‘Hind’ in Arabic and so the religion of the ‘Indians’ became known as Hinduism. This is not a term which is found anywhere in the Vedas (the Revealed Scriptures) or in any of the classical literature of ancient India. By Hindus, Hinduism is simply called Sanātana Dharma meaning the Eternal Path. a. The heterodox religion of the masses comprised predominantly of superstition, animism and placatory rituals to various gods and goddesses to ward off disease and disaster without any theological or philosophical base. These customs and beliefs differ widely from place to place and social group to social group within the sub-continent of India. b. The orthodox religion, often called Brahmanism which is based upon the Vedic Texts with a sound philosophical and theological base known as Vedanta. Although the various sects within the fold of Brahmanism hold variant theological doctrines; the practice is more or less uniform in the whole of the Hindu world. The orthodox Brāhmanic establishment can further be divided into 3 groups: The Smārtas, Śaivites and the Vaishnavas. who form the majority, are those who follow the Ecclesiastical Canons known as the Smṛiti and adhere predominantly to the Non-dual (Advaita) Impersonalist philosophy of the great reformer of the 8th century - Shankarāchārya. They worship all the five forms of the Godhead;- Śiva, Vishnu, Gaṇeśa, Shakti and Surya with preference for one particular deity which is known as an iṣṭa-devatā a tutelary deity. The Śaivites and the Vaishnavas are Personalists (those who hold the doctrine that God is personal) who follow their respective Sacred Scriptures - the 14 Śaiva Āgamas and the 108 Vaishnava Āgamas (Pāñcharātra) respectively. These Āgama texts deal with the worship of Icons, the construction of temples and the method of celebrating the periodical and daily festivals and ceremonies, as well as the conduct and personal spiritual development of the devotees. Śrī Vaiṣṇava, Madhva, Vallabhācārya, and Nimbārka. Although differing from each other in some theological and ritualistic points they are all similar in their theistic approach, that is, they all believe in a Personal God and adhere to devotion as the principle means to Moksha or Liberation from the cycle of rebirth. Of these four lineages the oldest and the largest is the Śrī Vaiṣṇava tradition, followed by the Madhvas who are found mainly in Karnataka state; the Vallabhācārya sect is confined mainly to small pockets in Rajasthan and Gujarat and the Nimbārkas are scattered throughout North India with the largest communities being around Mathura and in Nepal. There is no precise term in Sanskrit to convey the western idea of ‘philosophy’ or ‘theology’. The term used for a particular model of philosophical speculation is ‘Darśana’ which means a ’view’ a way of perceiving the Ultimate Truth; or a way in which a particular aspect of the Divine Nature is revealed. The term used for theology is ‘Brahma-vāda’ which means ‘discussion of the Ultimate Truth’. Siddhāṅta - means a philosophical conclusion which has been established by means of logical reasoning and Scriptural revelation. Vedānta or ‘Indian Philosophy’ is a Darśana - a way or methodology for perceiving the Absolute Reality, using systematic logic, scientific observation and Scriptural revelation (Vedas, Upanishads and Brahma Sutras). Dualism (Dvaita) - the metaphysical system of Madhvācārya. In this system Reality is conceived of as being a permanent duality. Non-dualism (Advaita) - the metaphysical system of Shankarāchārya. In this system the universe is seen from a twofold point of view - practical and ultimate: From a practical point of view the universe is said to be real but it is ultimately considered to be unreal (Māyā). The Ultimate Reality (Brahman) is Pure Being which is of the nature of Pure consciousness devoid of all attributes (Nirguṇa). The individual Self (Ātma) is identical with Brahman but has somehow become enmeshed in the cosmic illusion of worldly existence and through the delusive identification with the body/mind complex is subjected to an endless cycle of rebirths. When seen in dim light the rope is mistaken for the snake and one becomes terrified, but in the clear light it is seen to be a delusion and all fear disappears. The way to liberation (Moksha) from rebirth in this system is Self-realisation in which the individual Self realises it’s true identity as being Brahman (aham Brahmāsmi – I am Brahman) and this subsequently leads to an absorption of the individual consciousness back into the Cosmic consciousness resulting in the negation of individuality. The space in the pot is seen to be different from the external space, but once the pot is broken the inner and outer space become one. There is the practical aspect of a Personal God with attributes (saguṇa Brahman) and the Ultimate Reality which is devoid of all attributes (Nirguṇa-Brahman) and is pure being, consciousness and bliss absolute (sat-cit-ānanda). Worship of the Personal God with form and qualities (Saguṇā Brahman) is tolerated by the Advaita system of Philosophy only as a concession to ignorance, or as a preparatory aid to meditation on the Self (Ātman). This basic Non-dual philosophical paradigm is taught in various modified forms by almost all the schools of Yoga and New Age Spiritual Movements in the West. Śrī Vaiṣṇavism is another ‘View-of-Truth’ and like all the orthodox Darśana systems within Hinduism, claims the Vedas as its authority. The Vedas are the oldest literary compilations known to mankind, and are considered as Divine Revelation by all Hindus. They have been handed down in the Sanskrit language since time immemorial, and are considered to be eternal. The Śrī Vaiṣṇavas also accept the canon of the Pāñcharātra (Scriptures dealing with the practical accepts of spiritual life and ritualism) as authoritative along with the Divya-Prabandham - a collection of hymns of the Tamil saints (the Alvars). Because of the recognition of the authority of both the vernacular Tamil revelation and the Sanskrit revelation Śrī Vaiṣṇavism is often known as Ubhaya Vedanta - the Dual Vedanta. There are other Scriptures which are also accepted as canonical such as the Vishnu Purāṇa, Padma Purāṇa, Śrīmad Bhāgavatam etc. There are two categories of people who mediate knowledge and wisdom in Śrī Vaiṣṇavism; the Saints and the preceptors. The 12 Saints are known as the Alvars — a Tamil term meaning those who are “drowning in the bliss of God-realisation”. The first and the most prolific in writing was Nammalvar (Shatakopan). These Alvars all composed hymns of great poetic beauty in the Tamil pouring out their love and devotion to God and describing the divine visions they experienced. After the Alvars came the succession of āchāryas or Spiritual Preceptors. Of these the most prominent was Nāthamuni who collected these hymns and compiled a canon called the Nalayira Divya Prabandham (or Dravida Veda) consisting of 4000 couplets. The doctrines of the Śrī Vaiṣṇava faith, according to popular belief originated with the Supreme Person, Śrīman Nārāyaṇa, who taught them to His eternal consort Lakshmi; She in turn revealed them to Viṣvaksena - Martial of the entourage of the Lord. He in turn revealed them to Nammalvar (Shatakopan) the first of the Alvars, all of whom had direct experience of the Divine. The Āchāryas then received the teachings and handed them down to us through a succession of Spiritual Masters known as guru-paramparā. The three greatest of them being Nāthamuni, Yamunacharya and Rāmānuja. Śrī Vaiṣṇavism in its present form was structured by Rāmānuja Āchārya (1017 - 1137). The system of theology/philosophy known as Viśishṭādvaita (Qualified non-dualism) which has come to be associated with his name was not originated by him. He repeatedly states in his works that he is not teaching something new but is merely expounding the teachings of previous acharyas such as Tanka, Dramida and others. Rāmānuja is highly esteemed all over India, but his direct followers are prominent mainly in South India in the areas comprising of Tamil Nadu, Andhra Pradesh and Karnataka. There are also many centres scattered throughout North India. At the end of his life Rāmānuja āchārya entrusted the care of the Śrī Vaiṣṇava community to 74 pontiffs (simhasana-adhipatis). Their function was to continue the great work of spreading, initiating and teaching. These pontiffs established the 74 Matts or monasteries all over South India which are attached to one or other of the 108 principle Vishnu temples. One of Rāmānuja’s disciples named Rāmānanda went to the North to establish the Faith. Most of the Northern schools of Śrī Vaishnavism are affiliated to the Śrī Sampradāya through Rāmānanda. The Swaminarayan sect of Gujarat is also affiliated to the Śrī Sampradāya through its founder who claims to have been initiated in a dream by Rāmānuja himself. After Rāmānuja there were two exceptionally great acharyas; Vedanta Deśikan (c 1268) & Pillai Lokacharya (c 1213). and the Teṅkalai (Southerners) with their centre at Srirangam. The Kāñchī Āchāryas were constantly defending their theological position against the Advaitins, Buddhists, Jains and exponents of other philosophical systems and so they had to rely more heavily upon the universally accepted Vedic Scriptures and rules of logic and debate to establish their position. Tamil vernacular literature more than the Sanskrit in their discourses and were more liberal in their interpretation of orthopraxy and orthodoxy. There are 18 points of doctrinal difference between the two traditions called the Aṣṭa-daśa Bhedas. These differences which began as a purely philosophical dispute, spilled over into the sociological field as well. Consequently the two camps often differ with each other on various issues ranging from temple management to dressing arrangements and are not infrequently hostile. The doctrinal differences and disagreements have led to the creation of a controversial body of literature. The one school producing a work to support their position and the other producing a treatise to refute it! Both quote extensively from the Upanishads and the Divya Prabandham in support of their respective positions. Both are thoroughly convinced of the validity of their own position and the error of their opponents. The daily life and customs of the Śrī Vaiṣṇava are almost uniform in all places except for a few local variations. 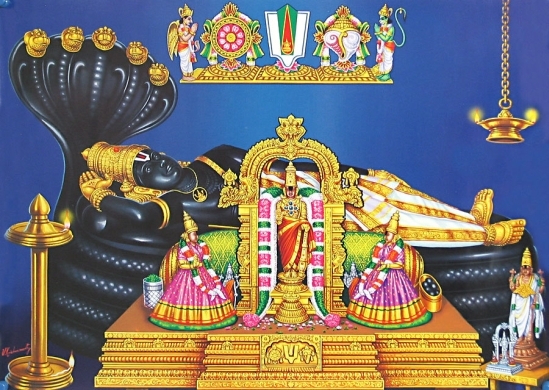 All observe the study and recitation of the Hymns of the Alvars and all temple rituals are conducted according to the Pāñcharātra Canon (except Tirupati where the liturgy is according to the Vaikhānasa Canon, and the Puri and Ananta-Padmanābha Temples where they have their own institutes and customs). While the three other Vaishnava Lineages propagate devotion (bhakti) as the means to attain God, the emphasis in Śrī Vaiṣṇavism is on total self-surrender (Prapatti) and worshipping of the Lord in the attitude of servants (Dāsya bhava). This is done through temple ritual and festivals governed by the ordinances of the Pāñcharātra. Most orthodox Śrī Vaiṣṇavas will live near a temple dedicated to Lord Vishnu and will pass their lives in devotional service. 5. Sriperumbudur the birthplace of Rāmānuja Āchārya. All together there are about 700 Śrī Vaiṣṇava monasteries or Mutts throughout India.